Adorable and functional! This mini bucket bag sewing pattern has two outside zipper pockets and one cell phone pocket inside. There is plenty of room for your makeup, wallet, keys and other goodies you take with you on the go! his bag was designed to show off Charm Stamps designed by Debra Gabel. 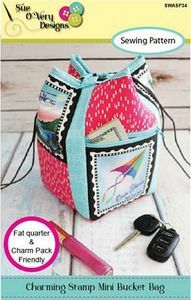 On the outside, along the bottom edge are featured two of the Charm Stamp which double as zipper pockets and along the top edge are the other two. The closure is simple and effortless using a drawstring inside loop method. The inside pocket is large enough to hold most cell phones. The base of the mini bucket bag has four purse feet allowing the bag to stand pretty and not get dirty when setting down. Purse measures 5-1/2in wide x 8in tall. Fat Quarter Friendly.